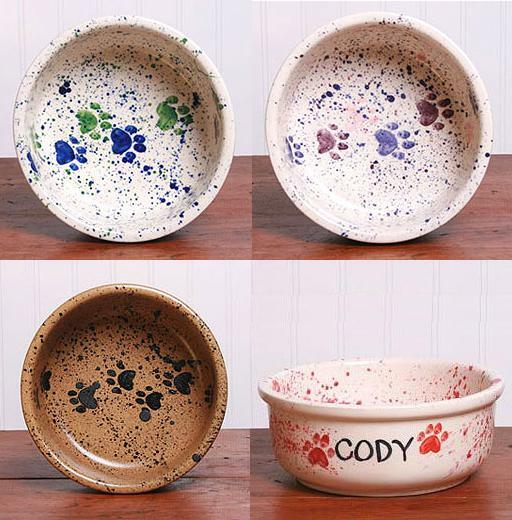 The Walking Paws Design features a pattern of paw prints walking across the bowl. It comes in 4 different colors: Go Green, Hot, Cool, and Pink! Personalization makes any pet bowl special and it is available as an extra optiom. Just enter the pet's name or a couple of words on the dish before you submit the order button. Please limit the name or words to 10 characters or less. Handmade and handpainted in USA. 100% lead-free. Dimensions: 8" x 3 1/4"
Dimensions: 6" x 2 1/4"
From top left to bottom right: Pink, Hot Color, Go Green and a personalized pet bowl sample.